Linda Mitchell-Storer has a sixth sense about clothing. When someone walks through the doors of her vintage and formalwear rental shop, Vintage Finery in Orrington , within minutes she has figured out what size they wear, what their measurements are, and even what eras of fashion they may or may not be attracted to. 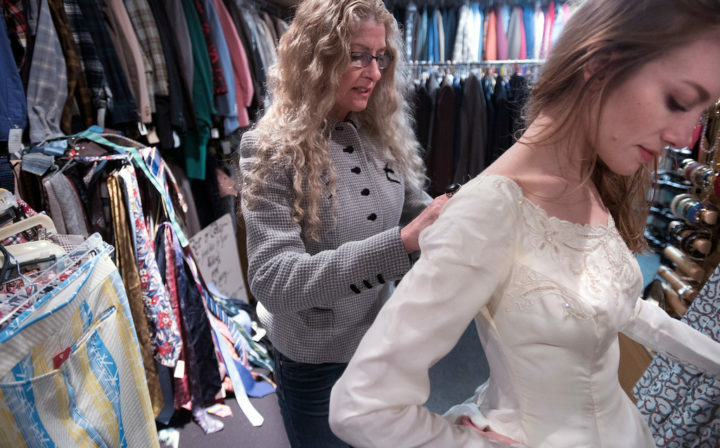 For 33 years, Mitchell-Storer has delighted in dressing up all sorts of people, from brides picking out a vintage wedding gown, to Halloween revelers who want a costume with wow factor, to high school seniors getting ready for prom. April and May are among her busiest times of year, with prom and wedding season both rapidly approaching. Linda Mitchell-Storer, left, helps her daughter Emily Mitchell-Storer put on a dress at the Vintage Finery in Orrington. 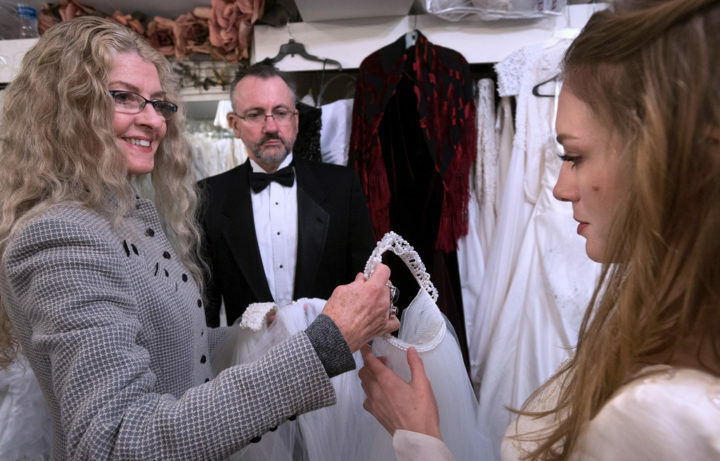 Linda Mitchell-Storer has for more than 30 years operated the costume rental shop where she has thousands of vintage, costume and historical clothing. Her obsession with fashion started when she was a child, the oldest of seven siblings. Mitchell-Storer amassed clothing for both men and women anywhere she went — estate sales, antique shops, flea markets, going-out-of-business sales, while traveling around the country with her husband, Tollef, and their three children, Aaron, Amelia and Emily. By the mid-1980s, she had so many clothes she didn’t quite know what to do with them all. Vintage hats, jewelry, accessories and clothes overflow at Vintage Finery, a vintage clothing rental shop in Orrington. Though the array of clothing, jewelry, hats, shoes and accessories can seem overwhelming to the casual observer, Mitchell-Storer has an encyclopedic knowledge of her tens of thousands of items. Walking into the shop, you first see a rainbow of vintage dresses from the 1960s and 70s. In the coat room, there’s everything from ivory white rabbit fur capes to 25-pound buffalo coat made from the skin of a bison. There’s sections for costumes for kings and queens, pirates, cowboys, fairies, Santas and Easter Bunnies. Upstairs, there’s the wedding and prom dresses — more than 400 in total, from demure, lacy 1930s gowns to poofy, cloud-like, over-the-top 1980s dresses. Mitchell-Storer’s youngest daughter, Emily, says she inherited her mother’s eye for fashion. She has not followed in her mother’s footsteps in terms of career choices, though she is often her mom’s preferred model for photo shoots. Linda Mitchell-Storer with her husband Tollef Storer and their daughter Emily Mitchell-Storer. Now 65, with three grown children, Linda Mitchell-Storer has finally decided that it’s time to retire. She’s not sure when, exactly, but Vintage Finery — what she calls her life’s work — isn’t something she can go on doing forever. There are several challenges in her way, however. Though Mitchell-Storer knows her inventory intimately, most of her knowledge isn’t recorded in a database. 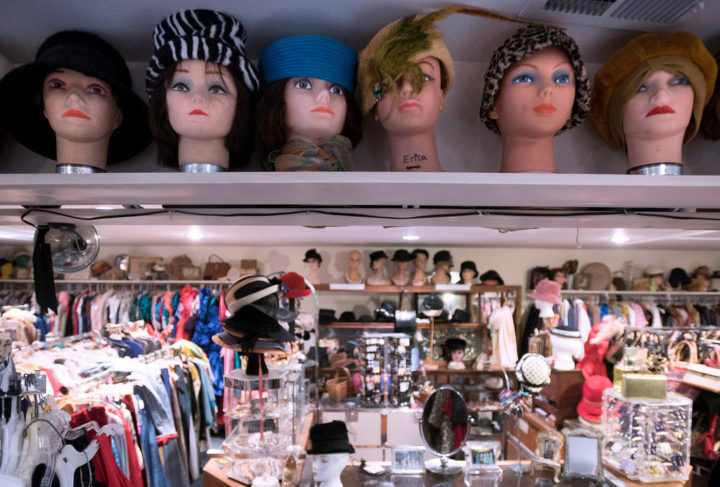 Everything in the shop needs to be catalogued and priced, a process that would likely take many months, and requires people with an eye for fashion and knowledge of the vintage clothing market. There’s also a matter that’s even more pressing: last summer, Mitchell-Storer was diagnosed with early onset Alzheimer’s disease. It’s a terrifying diagnosis made doubly difficult for her by the fact that she cared for her own mother, also stricken with Alzheimer’s, until her death in December 2015. 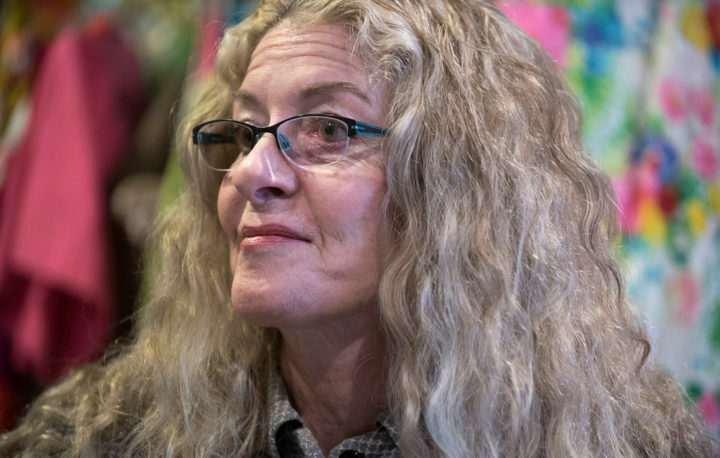 Though Mitchell-Storer’s symptoms currently are fairly mild, she knows there’s a time limit on how long she can keep on seeing clients for dress and suit fittings. Over the years, Linda Mitchell-Storer's fascination with all things fashion has led her to collect enough vintage finery to more than fill 4,000 square feet. Walking through the warren of rooms that houses her collection, Mitchell-Storer can’t help but find a story for nearly everything — big ticket items, like set jackets owned by Gilda Radner and Cher or tailored Italian suits, or smaller things, like the iguana skin cowboy boots she got out west, or the Carmen Miranda outfit she personally often puts on for Halloween. Vintage Finery is open by appointment; call 207-356-9560 to set up a time for a fitting.